Our study has proven beyond doubt that the Great Apostasy occurred in the first century! As we bring our study of the Great Apostasy to a close, I want to present two final thoughts somewhat unrelated to each other. Proper understanding of the time-frame for the fulfillment of the Great Apostasy provides a strong answer to an objection against the early date of Revelation. It is argued that the church at Ephesus “left her first love,” but this could not have been the case so soon after the complimentary epistle of Paul. Therefore, it is argued, more time was required from 62-64 AD, the proposed time for the Ephesian epistle, to 68 AD, the proposed time of Revelation. Since Jesus said the Great Apostasy would certainly occur in his generation before Jerusalem’s fall we must either accept that as fact or fiction. Coupled with how quickly the Galatians, Galatians 1:6ff, departed from the faith, and Paul’s warnings to the Ephesian elders (Acts 20:29f) the objection to the early date is untenable. 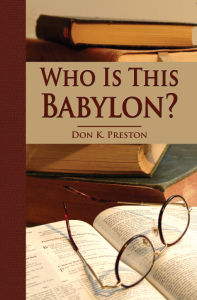 For more on the Great Apostasy and the Dating of Revelation see my Who Is This Babylon? There is a wealth of information in this book. The second point to consider is how the fulfillment of Jesus’ prediction of the Great Apostasy accounts for the “silence” in church writings from about 70 AD to the second century. If, as we contend, Jesus’ words of an apostasy so widespread that “most people’s love will grow cold” were fulfilled before Jerusalem’s fall, then who was left with the courage or inclination to record those events? Their lack of courage caused them to forsake Christ when persecuted; why would they suddenly take heart after the event? In addition, the cessation of the miraculous in 70 would of preclude the writing of any inspired records after the event. We believe the Great Apostasy is to large extent responsible for the period of silence. I have sought to demonstrate the fulfillment of Jesus’ words predicting the Great Apostasy. I have shown that Jesus did indeed predict one great apostasy — not two. I have examined the language and seen that he predicted the falling away for his generation. We have seen the magnitude of the event was predicted to be almost universal and seen the confirmation of that in the epistles. The ramifications of accepting the postulate of this article are tremendous for both amillennial and premillennial schools. The amillennialist contention of two apostasies is false and therefore applications of the Pauline predictions to the future are not proper. The premillennial posit that Matthew 24 was not applicable to the first century is untenable on linguistic and contextual grounds. The millennial structure therefore falls as well — there is no predicted future Great Apostasy. When it is acknowledged that Jesus predicted the Great Apostasy to occur in his generation, prior to his return, and when it is realized that apostasy did occur in the first century, one must also conclude that Christ came at the height of that apostasy just as predicted. The fulfillment of the prediction of the Great Apostasy demands fulfillment of the prediction of Christ’s parousia. The apostasy came — Christ also came.